I am so glad to be back with a guest blog post at OCB. Today I am excited to share with you a couple of my favorite educational apps that I use on the iPad and iTouch in my classroom! What I love about each of these apps is the versatility in ages and/or application in the classroom. This first app is a fairly new find for me but one of my favorites of all times. It is called Champs of Numeria. The app costs $0.99 but it was the best $0.99 since I spent this year! This is math game has so much to offer. The goal behind the game is to answer math questions, find the answer on the game board and ultimately get 4 squares in a row. The magic in this app is its versatility. The game is designed for four players, however, you can delete some of the players or you can have the “computer” be the other players. There are multiple characters to choose and my kids love that they get to choose their own character. My favorite part of the app is that you can customize each player, besides the character. The playing options include counting with pictures of dice shown (perfect for my kinder kiddos), addition and subtraction (at 3 different levels), multiplication and division (at 3 different levels), or mixed operations with addition, subtraction, multiplication and division (at 3 different levels). The different levels include Easy (which shows a picture of a completed fact family), Medium (which shows the fact family but does not include answer or largest number in the fact family), and Hard (which displays only the problem in a number sentence). You can see below all of the options you have in customizing each player. Make changes simply by touching the option you’d like on the screen. Counting option selected just by tapping on the picture of the dice. Multiplication and Division option selected on the Easy Level. One of my favorite features is that the app tells you whose turn it is. No more arguing about who gets to go next!!! To play, you choose one of the three available math problems at the bottom of the screen. I love that there are choices available because 1 – it helps everyone feel successful when they can find a problem that they can answer and 2 – it adds a level of strategy to the game which helps with those critical thinking skills. After picking your problem you find the answer on the game board. All you have to do is hold the answer for a couple of seconds until your character appears in the square. Players continue until someone has 4 in a row! The next app I want to share with you is ChatterPixKids. 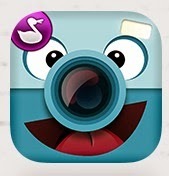 This is a free app with lots of uses in the classroom. This amazing app allows you to “give your photos a voice.” The idea is simple. Take a picture, draw a mouth, and then record narration. The fun comes in the final product – the picture does the talking! Once completed you can export the “video” to your camera roll. From there you can share it via e-mail, text, or even You Tube! Here’s a quick video by the creators of ChatterPix that shows how easy it is to use. The uses for this app in the classroom are unlimited. You could take almost any subject matter and use this app to have your students show what they are learning in a fun and engaging way! Here’s just a few ideas: practice re-telling a story; draw and narrate the water cycle; have the students draw themselves and then narrate how to solve a math problem; “publish” a piece of writing in video format; or use in a final project like we will be doing! My students will be finishing the year with a research project on an animal. As part of the final project they will be drawing their animal. I will take a picture of their drawing and then we will use it in ChatterPix. The kids will then narrate the facts they learned about their animal. I hope you have a chance to check out these amazing apps. « Appreciate Teachers in Style!